Important business content can now be kept in a secure and centralized location with OnBase. This enterprise content management software allows for the management of records, cases, and business processes. Fast-growing organizations can also benefit from OnBase since it is a technology platform that can be scaled up to meet their changing requirements. 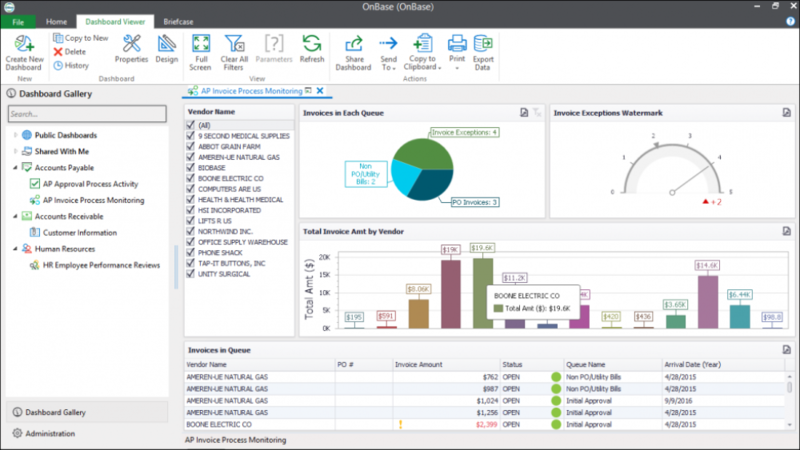 OnBase can integrate with a number of sectors, such as financial services, enterprise, government, healthcare, and a host of others. The solution specializes in content management, as well as in the optimization of data flow, which it accomplishes through the automation of rote decisions. Individuals and organization are free to pursue innovation once they start using OnBase. This is because the software aids them in information control and simplifies their routine tasks. Information can be captured, accessed, and integrated in a much easier way as all important content is centralized by OnBase in a single location that is also secure. An organization’s data distribution and overall communication is also improved since content that may be cluttered and unstructured are automated and centralized. The main benefits of OnBase are its document handling, its flexibility and scalability, and its extensive range of capture tools. Whatever stage it is on the enterprise content lifecycle — be it inception or final archival and destruction — OnBase can handle document distribution, document capture, document generation, and electronic signatures. It optimizes work processes, whether they’re unstructured or structured. Already extremely configurable workflows can be further empowered by features such as complex approval processes, document routing, rule-based decisions, tasks automation, notifications, and load balancing. Because of OnBase’s scalability and flexibility, it can support HR, finance, and accounting departments, in industries like healthcare, government, financial services, higher education, and insurance, just to name a few. Its archiving and imaging capabilities are strong because of its use of record management, business process automation, and document management. Meanwhile, using OnBase on the cloud allows users to use a data center-hosted system, which they access via an internet connection that is secure. OnBase users don’t need to be technologically-savvy and knowledgable at custom coding, as OnBase is a single system and not a combination of disconnected products. Only one system captures data and documents, which then scans these documents, imports them, and then extracts data from them, a process that users will find saves time. The nature of these captured documents is also preserved by the wide variety of capture tools offered by OnBase.